Russian Foreign Minister Sergey Lavrov said on Friday October 23, after meeting with his U.S., Russian and Turkish counterparts in Vienna, that the parties discussed the removal of Syrian leader Beshar Al-Assad. The meeting brought together Lavrov, U.S. Secretary of State John Kerry, their Saudi counterpart Adel al-Jubir and Turkey’s Feridun Sinirlioglu to discuss the Syrian crisis. Sputnik, a Russian news agency, shot down rumours that the discussions yielded an agreement on a deadline for Assad’s removal. Lavrov stressed that as the Russian president has made clear in his latest speech, focusing on regimes and leaders of countries will only lead to a repeat of the experiences in Iraq and Libya. Lavrov added that his country believes that decisions about the fate of Syria, its president and other figures should only be made by the Syrian people. 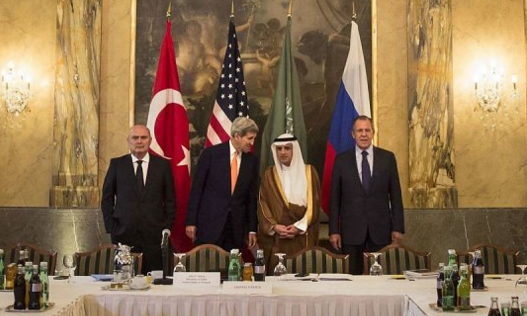 The US, Saudi Arabia and Turkey have insisted on the removal of Bassahr Al-Assad. Adel Jabir also confirmed Lavrov’s statement, saying that no decision was made at the meeting concerning the fate of Beshar Assad.